How does one show love? People choose to display affection through many outlets. Whether it’s a huge hug with a dear friend in a troubling time, helping your mom hang Christmas decorations or taking your brother’s children for the night so he can have date night, it is irrelevant how you love, as long as you are freely giving it. Equally important to displaying love and affection, is being able to graciously accept kind gestures and sweet words from others. Frankly, I have a very difficult time allowing myself to receive tokens of gratitude and caring words. If someone compliments my ensemble, my gut reaction flashes to the scene in Mean Girls where Regina George tells a fellow student, “Oh my God! I love your skirt.” A few seconds later, she turns to Cady Heron and says, “That is the ugliest f*ing skirt I’ve ever seen.” Likewise, if I come home to a meticulously clean kitchen, I instantaneously think someone is going to give me some terrible news like my husband has left me to become a ski-lift operator. My therapist and I are currently working on these issues, while I count the ways I can give love to everyone this Valentine’s Day. Valentine’s Day, although a commercially crafted faux-holiday, can be an ideal time to shed kindness through words, gestures, gifts or, even more precious, making time for those close to your heart. The Christmas holidays may feel like yesterday, and our bank accounts are left a little depleted, but that should not stop us from playing Cupid. It is not necessary to spend a fortune on frivolous things, and it is the thought that counts. However, if you do want a little something extra to give this month, we have found the perfect place to pick up some love. ALG Style is addicted to all things pretty, and we love to give pretty things. We advise you to take a trip to a delightful new spot at the end of Metairie Road called Wildflower Boutique. 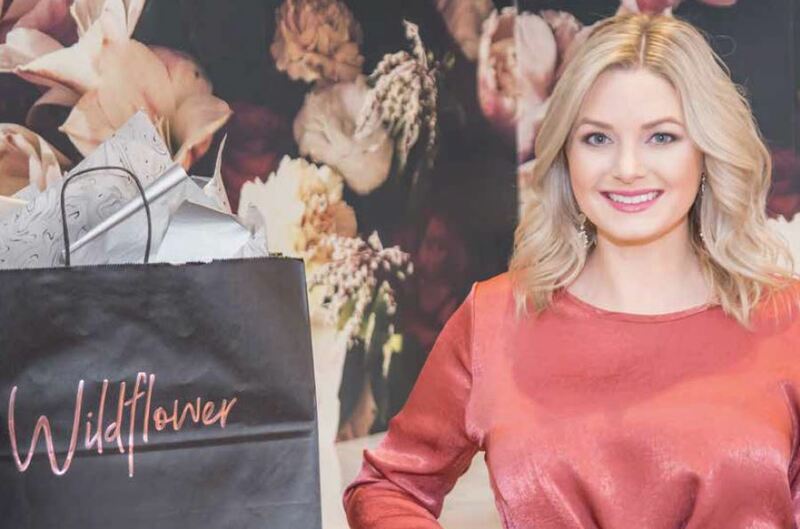 Danielle Conrad opened Wildflower just a few months ago with love in mind. Conrad’s mother, Mary Frances Smith, opened the original Wildflower Boutique in her hometown of Morgan City when she was just 15 years old. Conrad would attend market with her mom, and, in between breaks in school and jobs, she looked forward to working at Wildflower. “I moved to New Orleans in January 2017, and my mom urged me to open a new store,” Conrad says. “She is amazing when it comes to selling, so here I am on Metairie Road with a Wildflower of my own!” Wildflower has inventory for a woman of any age and budget, and the store has such a welcoming, quaint and relaxed atmosphere. “The ideal customer at Wildflower is a mother-daughter duo, since that is what my mother mastered at her own store,” Conrad says. There are plenty of trendy yet price-conscious pieces for a young college girl as well as chic and on-trend items for the more discerning, mature shopper. Conrad shows love and affection by greeting those she admires with a hug and always says, “I love you,” with her goodbyes. Special notes and thoughts from friends should never be underestimated, and when people that tell you they love you at random and unexpected moments, it should be deeply cherished. Wildflower has some charming gift ideas for your best gal pals, co-workers and siblings on Valentine’s Day. Conrad suggests a pair of super chic yet reasonably priced pair of Sonix sunglasses for your sassy sister; statement earrings by Bauble Bar for your BFF and a disco ball party cup for colleagues that you could not live without. We strongly encourage you to play Cupid and spread the love, although ALG prefers you do not dress up in a diaper and shoot people with sharp objects. Whether it is through romance or kindness, or having a play-date with your girlfriends, give all your love away. Have a very sweet February and happy shopping at Wildflower!